From our point of view, the northern Italian ski village of Bormio is the center and staging area for some of the most famous climbs in the world - in order of difficulty within 50 kilometers of Bormia are 1. Passo dello Stelvio (Prato Allo Stelvio), 2. Passo Mortirolo (Mazzo di Valtellina), 3. Passo Mortirolo (Tovo), 4. Prato Maslino, 5. 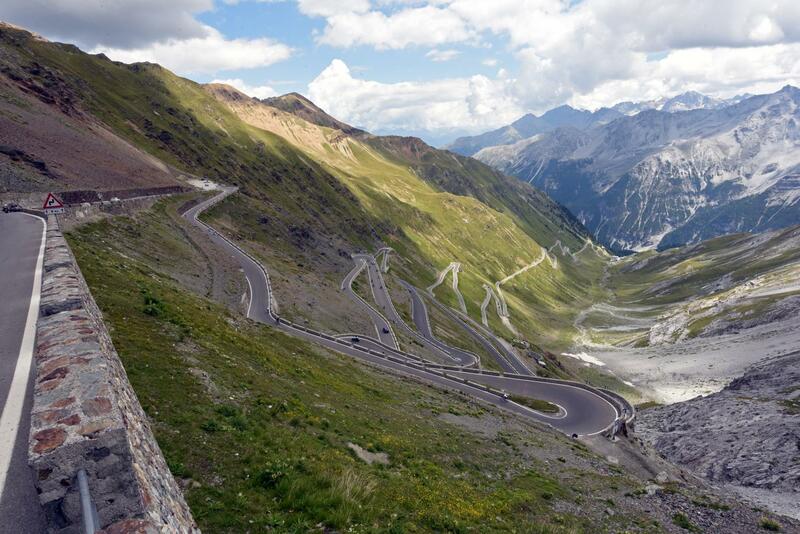 Passo Stelvio via Umbrail, 6. Passo dello Stelvio (Bormio), 7. Passo Di Gavia (Ponte di Legno), 8. Umbrail Pass, 9. Passo Mortirolo (Grosio), and 10. Passo di Gavia (Bormio). PJAMM has ridden all of these climbs and they are truly magnificent and exceptional climbs - Bormio should be considered a world cycling hub. The climbs in the Bormio area can be viewed via the map below (zoom in to view climbs in particular areas), by a detailed list of the climbs that can be arranged by difficulty, distance (longest climbs in the area), altitude gained, highest elevation (highest summit), average grade (sort the grades by varying distances), lowest start point, etc. Click on "Climb Page" to jump to the detail page for that particular bike climb. We feel this page provides a good summary of the best bicycling and biking climbs in the Bormio area. We have climbed in this area in 2016 and 2017 and, because this is simply one of the greatest climbing spots in the world, we are returning from July 26 to 29 to ride them all again!